Composable Enterprise is the only Intelligent DataOps platform that seamlessly integrates a wide variety of unique business process automation technology with a complete portfolio of tools for processing, orchestrating, and analyzing complex data models. Other examples of Rapid Application Development in Composable Enterprise included DataFlows activated by a wide variety of triggers, and fully-integrated real-time alerting capabilities. Composable DataFlows are essentially visual data bots that capture business processes. Composable’s approach to Rapid Application Development and Robotic Process Automation are shaping the way data professionals work, ultimately liberating them from mundane, repetitive tasks and allowing them to focus on the interesting problems! This is truly Intelligent DataOps. The emergence of big data has enabled individuals and businesses to leverage a vast array of information. However, collecting massive amounts of data is, on its own, no longer sufficient. Today, it is understood that the integration of data, from all sources, yields the most beneficial information and users, therefore, must be adept at fusing and synthesizing data from numerous and often disparate data sources, consisting of data in various formats and structures. Users typically follow a standard analytical workflow in a series of steps to analyze their data. This is the process in which an analyst mines, filters, pivots, and exploits data to extract insights (e.g., actionable insights that improve business processes). For example, the analytical workflow is a process that typically includes the following steps: identification (of data and data sources), preparation (of data, through cleansing, structuring, filtering, etc. ), development (of algorithms and analytical methods), deployment (of the process into a business solution), and execution (of the workflow). In Composable, the analytical workflow is represented as a DataFlow, a directed graph with functional blocks at the nodes. Functional blocks have inputs, perform an execution step, and then produce outputs. Functional blocks can perform any of the tasks required for the analytical workflow, from ingestion of data to data preparation to advanced analytical functions that facilitate the fusion and exploitation of data. In this way, Composable DataFlows step through the entire process of performing the extraction, transformation, loading, querying, visualization, and dissemination functions. 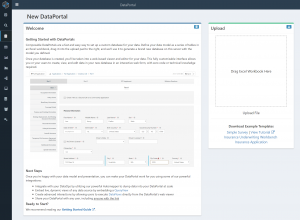 While other tools also provide a flow-based approach to the analytical workflow, Composable provides an intelligent “self-service” approach to authoring DataFlows. Composable’s DataFlow designer continuously learns and intelligently recommends steps in the process to accelerate the development of an analytical workflow. Automated recommendations are based on both rules-based and machine learning driven approaches. Our unique approach uses “strongly typed” data flowing between the functional blocks as well as an understanding of user actions, previous uses of the functional blocks, and the data sources and data types. Ultimately, Composable offers machine learning methods to assist users to develop machine learning workflows! This is truly Intelligent DataOps. Enterprise data exists in a variety of formats and locations, but often relate to the same object, or entity. Entities can be customers, SKUs, etc. Data unification across all of an enterprises data sets is a goal many organizations are unable to accomplish using traditional methods. 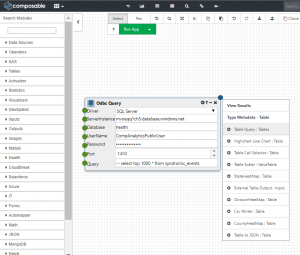 Composable’s EntityHub is a machine learning approach to master data management (MDM) and data unification. Users are able to connect to disparate data sets, and allow the machine to adaptively join records across data sources given their various fields. In this way, unique entities are created, duplicate records and information are discarded, and enterprises are able to define a Single Source Of Truth (SSOT). While all organizations attempt the three steps of advanced data science, 1) Collect Digital Data, 2) Integrate Digital Data, 3) Find Impactful Insights, most fail at step two. 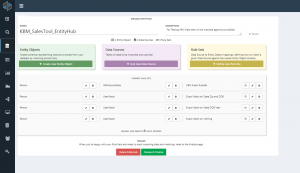 Composable’s EntityHub allows organizations to quickly complete these steps and move on to the following steps, 4) Build Advanced Models and 5) Measure Digital Results. This is truly Intelligent DataOps.